If you've begun using HappyFox for a while now, you may have noticed settings for outgoing email in two different sections of your account. One can be found under Manage >> General, and the other appears in a category's configuration under Manage >> Categories. The Outgoing Email Settings you find under Manage >> General is used to send system-generated emails. These include password reset emails, email change verification emails, staff invite notifications, etc. ; basically emails that would have a "no-reply@" as the FROM address. You also have the option to have these emails sent from your own email server. Just select the appropriate option under SMTP Server, and include your SMTP server's details and credentials. Categories are configured to send and receive emails, to and from your customers, as tickets. The Outgoing Mail Options in a category under Manage >> Categories, is the setting that is used to send emails to your customers, when you create/reply to tickets. The From Address configured here is what the customer would see in the FROM field of the emails they receive. 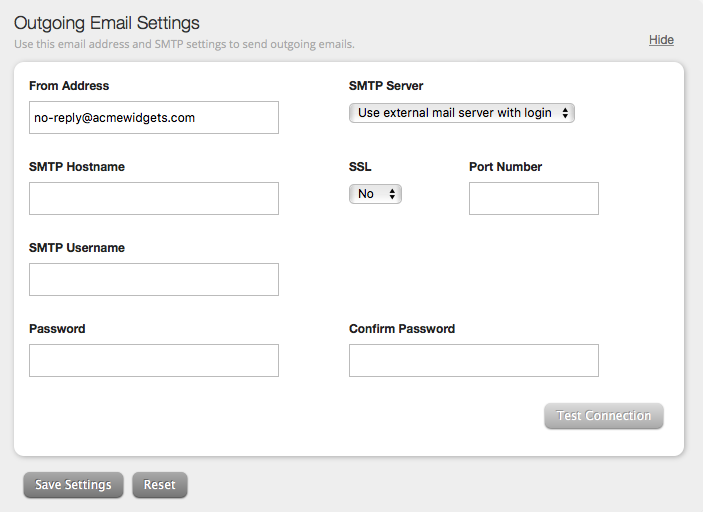 You may also configure your category to use your own SMTP email server for sending these emails. To summarize, the outgoing mail settings under Manage >> General is used for system-generated "no-reply@" emails, and the outgoing mail options under Manage >> Categories is used to send ticket update notifications. How to add image in category signature? How to configure an outgoing SMTP for a Category? What are Public and Private categories?